Golf irons are some of the most expensive things on your golfing kit or bag, and so it is vital to make sure that you always buy the best. The irons also constitute a majority of the clubs on your golf bag, and this means that they have a massive impact on your game and so you cannot afford to have low-quality ones. Buying the best might look like something easy but any golfer will tell you that it is not. Without the right knowledge and information, the fact is that you will not have an easy time shopping for the irons. The important thing for a golfer that wants to own the best forgiving irons is to understand some basics about them and also what to consider when buying them. Hollow Construction: One of the most outstanding and impressive elements of the Launcher HB set of irons by Cleveland Golf is that each club has a hollow construction. This construction is what makes it possible to distribute the weight lower and deeper on the iron’s head for maximum forgiveness. Also, the hollow construction will provide incredible impact stability. HB Crown: The HB crown is one of the key features that make Cleveland irons stand out. It also helps in establishing a lower and deeper COG that helps to promote higher launch conditions. 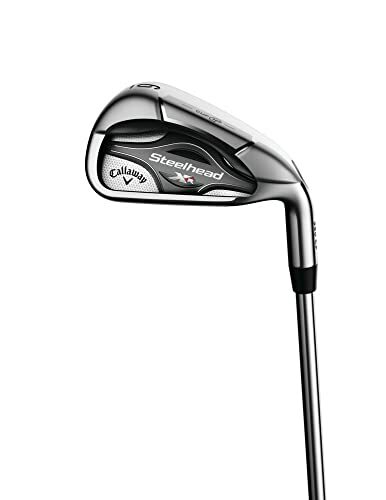 Steel Face Inserts: Cleveland uses high strength steel for the face inserts on each of the irons in this set to ensure that they will flex more when they make the impact with the ball for faster speeds. Progressive Set: Because this is a progressive set, almost each of the irons will be handy in a round of golf. The short irons are designed for control while the long irons provide distance and great launch. Shafts: For the shaft, the irons use True Temper Steel and Miyazaki graphite shafts both of which are top-notch quality and high-performing. 360 Face Cup: The Big Bertha irons set are designed to provide high ball speeds across the face. They achieve this using the 360 Face Cup that ensures you always get distance where you want it. And if you combine this with the iron’s internal standing wave, these are some of the hottest irons out there. Hollow Body: Like most other high-quality irons, these ones have a hollow body that makes it possible to have most of the weight in the critical areas so that golfers always get a highly forgiving club. With this construction, you can be confident that you get higher launching and straighter flying shots. Advanced and Progressive Look: The progressive set composition of the Big Bertha irons ensures that they will not only work for one shot but for your entire game. These clubs make use of a unique sole design to achieve this. And it entails giving the set’s shot irons a relatively narrower sole and having a significantly wider sole on the long irons. 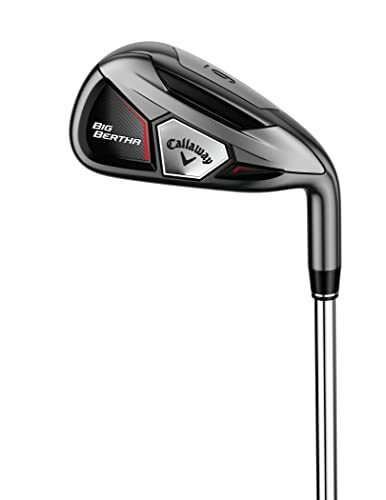 Premium Shafts: Callaway combines there golf irons with premium aftermarket shafts for maximum performance, and they offer both steel and graphite options and in regular, senior and stiff flexes. 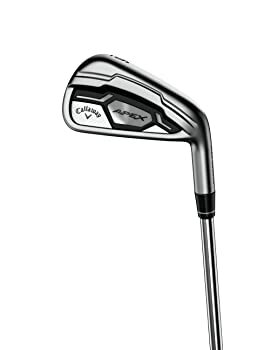 High-Speed Cavity Back: A cavity back with high speed is what gives these cup-faced Irons their fantastic playability. 2-Piece Construction: The 2-piece construction that also entails offering the Irons a dual heat treatment gives them an impressive level of refinement. You will not find any other irons with similar meticulous craftsmanship like these. Cup 360 Face Technology: The Cup 360 is a revolutionary technology on the club head that acts as spring for every shot that you make. And so you can be confident of increased ball speed regardless of where on the face you hit. Internal Standing Wave: This technology helps to lower the COG, increase the MOI and it also contributes to giving the face more flex so that you can get extra ball speed. Wide Sole Design: The wider soles in these clubs make them more forgiving, and golfers can also get more distance on every shot. Shaft: True Temper graphite shafts are one of the other things that make the irons unique, but there is also a steel option available. The ball flight that you get is just perfect (not too high or too low). You can buy the particular iron that you need instead of the full set. Club face is not bulky or too big. Stainless steel body and face gives the Irons impressive durability and performance. There is also an option to choose between steel and graphite shafts. The Irons are long and smooth enough for most types of golfers. Their modern and stylish appearance will impress any golfer. Few other clubs can match their fantastic forgiveness. You will not find a better Sand Wedge than the XR. You do not get any feedback on your mistakes from miss-hits because they still feel solid. Some golfers complain that the clubs flex more than other regular Graphite Irons. There have been a few instances of the club face cracking after a couple of months. The grip is not the best, and you might need to change it. Buying them as individual clubs is way more expensive than purchasing a full set. 360-Degree Cup Face: The 3-7 Irons use the 360-Degree cup face, and it gives them impressive ball speeds and distances. Extreme Soft Feel: Precision milling, precise forging, and the mild carbon steel are what combine to give the individual Irons their extreme softness. The soft feel might not seem like much, but it will make you want to swing them with every opportunity, and it is one of the features that define the best game-improvement iron sets. Multi-Piece Construction: The fantastic combination of speed, control, and distance that these irons will give you comes from the high-tech multi-piece construction. Longer irons use the 360-Degree Cup technology while the shorter ones (8-AW) have a unique faceplate for distance control and enhanced feel. Scoring Performance: You get scoring performance with these irons from the sole widths, progressive offset, and notch weighting which provides forgiveness, playability, control and ball flight for all the Irons. Shaft: You can get the Irons in Stiff, Regular, and Senior Flexes and all of them are from a sturdy graphite material. Hand Orientation: They are available for both left and right-hand orientation to ensure that they cater to different playing styles. The irons have a solid feel. Any miss-hits will not stray off the target. They make a muted and pleasing sound on impact. The irons are all long and straight. You will always get fantastic forgiveness and distance when using these clubs. These golf clubs will also provide an excellent feedback so that you can know what to improve. They have an extra soft feel which most golfers seem to love. The classic look with an excellent profile on these irons is just fantastic. Forged blade provides a bigger sweet spot than what you get from others. The PW is a great disappointment when you want to make full shots. These irons might not work well for light swingers. Some golfers complain about the lofts being up to 2 degrees off. Satin finish will wear off after a few rounds, and this leaves the club looking terrible. Face Design: The face of this Iron is one of its most impressive features because of it is large, thin and unsupported appearance. It also has a new Speed Pocket that will give you ball speeds that will leave you astonished. Weight Savings: M2 employs three impressive weight-saving features which are the 360 degrees undercut, L-shaped Toe design, and thick-thin fluted Hosel to produce stronger lofts without interfering with the peak trajectory. V-Shaped Badge: Although the V-shaped design is not unique to this Iron it is an excellent addition because it helps to produce an amazing sound on impact and it also dampens any unwanted vibrations to give the club an incredible feel. Shaft: The shaft on this Regular flex club is steel, and so you can be confident of an impressive performance at all times and durability that only a few other wedges can match. Lie and Loft: M2 wedge is a standard Lie club, and the loft is 55 degrees hence meaning that even players that are just getting into the game can also use it effectively. It produces an excellent sound on impact. The V-shaped badge dampens any unwanted vibrations to improve the feel of the club. You always get an exciting distance when using this Iron. This Iron feels well balanced for most golfers. M2 is very forgiving, and you can be confident that it can overcome all your flaws. Perimeter weighting gives golfers effective control. 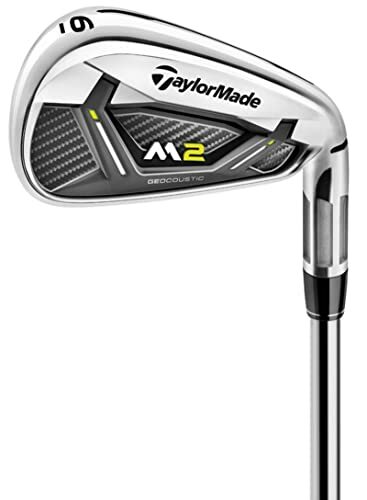 The M2 Wedge is very affordable when you compare it with others. It has a large sweet spot that makes it ideal for use by a newbie. This Iron is pretty accurate, and this is what most golfers want. The club head and shaft materials are all high-quality to ensure durability. You cannot have it customized to conform to your swing. Some golfers might find this iron too thick. It is quite dull looking, and it might not impress those looking for something aesthetically appealing. In between yardage is not always easy to lock in when using this iron. The multi-material design that also includes a spined-hosel looks too busy. 360 Face Cup: While Callaway makes use of various technologies to improve the performance of their irons, 360 Face Cup is proving to be one of the most popular. For the Rogue X iron, it will work with another unique feature (Variable Face Thickness) to expand the sweet spot or section of the face designed to generate high ball speeds. Internal Standing Wave: Another common feature of Callaway irons and a few of their other clubs, and its main purpose is to ensure that you always get an optimal ball flight and excellent control. Tungsten Weighting: With the tungsten weighting, it is possible to place the iron’s COG with more precision than what many others can offer, and this, in turn, results in better launch and control. Urethane Microspheres: The urethane microspheres on this iron aim to address the shortcomings of regular thin faces and typical urethane faces. And they do this by providing the sound and feel that you get from a vibration reducing urethane club face but without having to compromise on the ball speed. 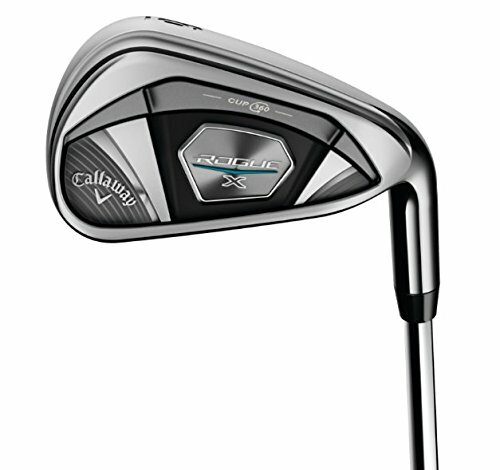 Shafts: As it has become the norm with most Callaway irons, the Rogue X allows golfers to pick between steel and graphite shafts depending on what suits their handicap. And both are also available in stiff, regular and the senior flex options. Shock Eliminator Tech: With the soft and steel-infused shock eliminating technology, this iron will absorb most of the unwanted vibrations during impact for a great feel. Also, this technology helps to lower COG to ensure a higher launch. 360 Face Cup: You cannot go wrong with any Callaway club that uses this clubface technology. It entails adjusting the shape and design of the face to alter the flex so that you always get faster ball speeds and hence increased distances for both the on-center and off-center shots. Bore-Thru Hosel: A relatively new and quite unique iron feature, and it is meant to help reduce some significant amount of weight around the hosel which is then strategically placed around the head to make this a more forgiving club and to provide an easier launch. Shaft: Whether you prefer the strength and stiffness of steel shafts or the lightweight and great flex of graphite this iron will work for you as it is available in both options. Also, you can get the flex in senior, stiff, regular and also in a ladies flex. Irons are the clubs that you will use when you are less than 200 yards from the green. And so you do not only need something that will give you enough distance but also guarantees you accuracy. For this to be so here are some important things about these clubs that you should know. A basic or standard golf kit will have a total of 14 different clubs with irons making up a bulk of them. The set of irons in the best golf bag, on the other hand, comprises of eight golf clubs which are the 3,4,5,6,7,8,9 irons and the Pitching Wedge, but some experienced players will also have the 1 and 2 irons on their set. Some golfers play at a high handicap (21-28) and so they need a particular type of golf irons. These irons are the super game-improvement, and they have a large offset to make it easier for golfers with high handicaps to hit the ball. 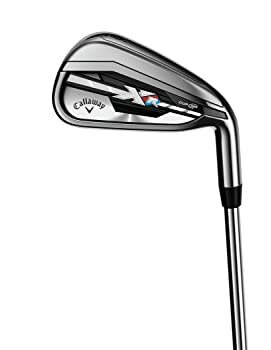 These kinds of irons are easy to use and also very forgiving, and they are perfect for golfers with a mid handicap (15-23). Their COG is low, and this gives players the ability to launch balls from steep angles. Golfers with a handicap that is in the mid-low category (8-17) and want an iron with dual forgiveness and performance should go for the Intermediate irons. They are less forgiving and work best for skilled and experienced golfers. The Players irons are unique, and they are for professional golfers or those that have been playing the sport for many years and have mastered it. They are for low handicaps (0-10), and they have the deepest and lowest COG. Whether you play golf at a professional level or you just enjoy playing a few rounds with friends over the weekend, it is still important to get the best golf irons. The irons are the clubs that you will use most when playing and so if you do not have the best ones you will not play well or even enjoy the game. To make sure that you always buy the best game Improvement irons you should always consider the following factors before buying. Irons come in two different styles which are the Cavity Back and Muscle Back. It is essential for golfers to consider the features of each of them so as to choose the best. The Muscle back is forged, and it offers golfers a solid heft. It does not have hollow areas as it is has a clubhead with a full back. Professionals prefer the Muscle back because it is consistent in every shot. The Cavity Back, on the other hand, is cast, and it has a hollow section on the back of the head which gives it a weighted perimeter It is perfect for amateur golfers as it offers them better accuracy. The shaft is an important part of the club, and it determines its performance and durability. When shopping for Game-Improvement irons, it is important to consider the shaft material, and for this, you will have a couple of options. You can choose to go for a graphite or steel shaft, but this will depend on your skill level. If you are inexperienced, steel is the best option because it is heavy but it provides you with better control over your swings and ball direction. Graphite ones will require the firm hand of an experienced golfer because they are lighter than the steel ones. You cannot get good irons if you do not consider the design of the clubhead. These clubs come in three different sizes which are the traditional blades, mid-sized and the oversize head. The regular ones are perfect for professional golfers because they give them more control over the ball while the mid-sized are ideal for golfers that want to improve their game. Oversize head irons have a large sweet spot, and they are also very forgiving, and this makes them ideal for newbie’s as they always guarantee them a good shot. Just like with most other golf items you have to consider the price of the irons before you decide what to buy. The best thing is to come up with a budget or set the maximum amount of cash that you are prepared to spend on the golf clubs. Price is a major factor because some can cost up to $1500 and it is also possible to find others that come with a price tag of less than $500. You should know that price does not always reflect quality because some brands are just expensive for nothing. The good idea is to shop for a quality set that is within your set budget. Most people tend to forget about their golf handicap when shopping for irons, and in many instances, they end up with the wrong ones. As a golfer, you have to know your handicap if you are serious about the game as this is what should guide you with the selection of all types of clubs. Make sure that what you settle for conforms to your particular handicap needs as this is the only way you will get to enjoy the game and improve your skills. You cannot tell how good the irons are if you do not try them out. And so, experts will tell you that the most important thing to do when shopping for irons is to try out a few so that you can get a set that works best for you. Also, finding the best set will require you to do enough research and dedicate your time to the search. But, in the end, it is worth the effort as you will get to enjoy your favorite sport.